Okay, so I'm just going to go ahead and call this vintage week. This is my last and most favorite discovery in my box of old clothes. 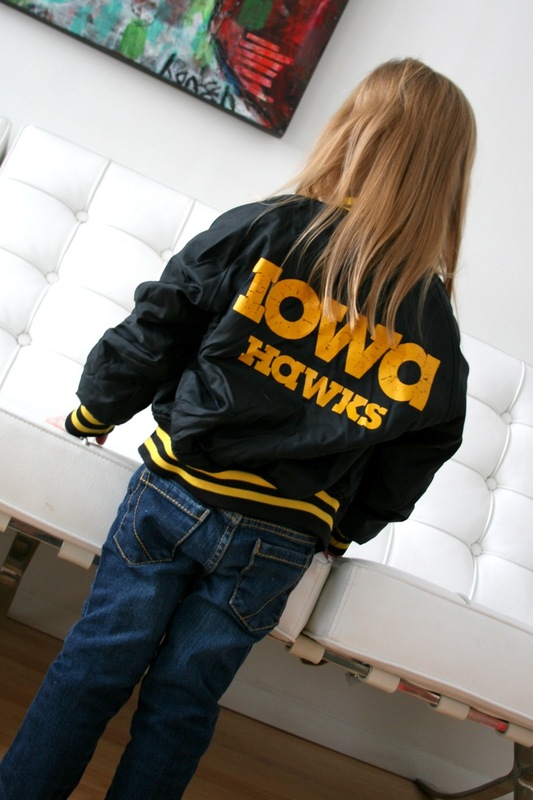 A mini old-school Iowa Hawkeye jacket! My dad has always been a pretty huge Hawks fan (and then I had to run off to Iowa State.) But both me and my brother sported these awesome jackets for a few years in the 80s. I'm really enjoying these posts. She looks so cute in your jacket! haha...i love that jacket on her! so awesome she's able to wear your old clothes...you must be a proud mamma right now! Beauty! I'd love one of these for my boys. The Okaboji shirt is pretty slammin' too.